Guru Sabd inspired congregation of Sikh Dharma, Jathedar Akal Takhat Giani Joginder Singh Vedanti and heads of all sacred takhats, Representatives of Shromani Gurdwara Parbadhak Committee and Delhi Gurdwara Parbhadhak Committee, Sri Sikdare-Khalsa Guru Amrit Kaur Khalsa, representatives of the Government of India and the American legislatures, and the guests from all over the world. It is with a deep heart that Amrita and I came to Espanola to take part in the last rites of our long time friend, Yogi Harbhajan Singh ji (who left his body on October 6th 2004). Although we are joining his numerous friends in prayer, we are also celebrating the beginning of a new chapter in Sikh history of a Sikh movement outside Indian subcontinent. Where as we are sad at the untimely death of our friend and the end of an era in the American Sikh history, we celebrate this event with enthusiasm for the beginning of a new chapter which we hope may be destined to change the history of Sikhism in North America. Forty nine years ago, I left India to further my studies in the USA. Among those whom I saw in Delhi before my departure was my friend and colleague, Harbhajan Singh. He saw me off to the new world. Little did I know at the time that, 49 years later, I would travel to Espanola to see him off to his journey to the Timeless - as we call it in our tradition. I do not know why it is important but I must tell you nevertheless. Before I left Delhi, Harbhajn, as we called him, asked me to make a special visit to the Indian Parliament where he was employed as a security officer. Because of his position there, he gave me an unusual and special tour of the parliament. Again I did not realize that he might be preparing to guard our national airports and establishments in the USA at some point in his future. As most of you know, Yogi ji and I go back quite a way. We met at a time before he became Yogi and I became a cheer leader for celebrating the Guru Granth. We were both Sikh youth activists in the Indian sub-continent. The All India Sikh Students Federation (AISSF) brought us together. I hope you will understand when I say that it was quite a daunting experience for a relatively shorter youth to encounter a tall handsome youth who was out to tear us apart. But I still remember all our encounters with pleasure. Before I get further, let me tell you something more about AISSF that we worked together to build and nourish. AISSF was organized in 1943 with a view to organize Sikh students in the schools and colleges of the Indian Sub-Continent in order to inculcate a love for their Sikh heritage. Sikh students were prepared in leadership skills to carry on their responsibilities to preserve and promote their rich heritage in all walks of life in their adult years. AISSF organization was credited to produce Sikh leaders in all walks of life from religion to politics during the twentieth century. Indian Prime Minister, Manmohan Singh, was a member of AISSF during his high school days, so was Honorable Tarlochan Singh MP who served as Chairman of the Indian Minority Commission. Professor Satbir Singh who re-wrote the exegeses of Sikh theology and Sikh history was my constant colleague in AISSF. So were Sardar Manjit Singh Calcutta and Pradhan Sahib Gurcharan Singh Tohra who guided the SGPC to its present stature, and Sardar Dilbir Singh who shaped Chief Khalsa Diwan to its present heights. Reputed scientist like Dr. Narinder Singh Kapany, a political activist like Governor Surjit Singh Barnala, Dr. Harbhajan Singh Soch, the Vice Chancellor of a major Sikh University, Indian Ambassador Dr. Jaspal Singh (Vice Chancellor of Punjabi University), Captain Manmohan Singh who conquered Mount Everest as the first Indian to do so, to name the few other leaders, were those who shaped our destinies in this century. Suffice it to say that AISSF trainees constitute the list of Who Is Who of the contemporary Sikh leadership in social, religious, political and educational fields. Harbhajan Singh joined AISSF during the years of Indian partition and served the organization during his college life in Delhi. For many years he remained a member of the National General Assembly of AISSF. I was inducted in the National Executive Committee in 1947 and elected to be the national president in 1954. For your information, I towed the mainstream line and Harbhajan Singh led the rebellious group among Sikh youth. We both were working for bringing Sikh students back to the Sikh fold and building a virtual school for the future Sikh leadership in India, I was building the school with available material and he stood for reforms within the organization. Thus, we found ourselves often in opposite camps but only at the time of AISSF’s national elections. During the remainder of the time we both worked to builc the organization and kinship among the Sikh youth for a brighter Sikh future in India and abroad. In North America, the earliest meeting with Yogi ji I recall is the one in Boston in the early nineteen seventies. He came to Boston on a speaking engagement. He sent for me to come to see him and I did. I heard him speak at a public gathering. After his presentation, he invited me in his room and we spent time chatting on our pastime activities. He told me what his plans were and I told him what I was doing. At the time of our first meeting in the USA, I was engaged in building my professional career in Academia, needing to earn a living along with serving society. And in Sikh Studies, I needed to strengthen my skills for future writings on the Sri Guru Granth Sahib. Yogi ji was building a yogic and tantric organization which would attract many youth towards the religion we both loved and admired dearly. What I understood of his plans was that he was going to use those tools to attract the attention of the youth in America and then expose them to Gurmat (ways of the Guru). He believed that the message would be ignored if he started with Sikh practices right away. The moment we met, we discovered that we shared quite similar views on the future of Sikhs in the emerging global society. Both of us knew that the Sikh future would be ensured when the locals would buy into it. He would promote the technology of yoga that could attract American youth and I would continue to carve my role to promote scholarship among Sikh Diaspora and American academia. This scholarship would be crucial in creating data bases of the Guru Granth teachings in the language of the West. Yogi ji ended our first meeting by telling me, "we must stand together," and that's exactly what we did in the years since, as friends and as Sikh activist allies. He told me that he would continue to employ his newly discovered technology to open communication with American youth and I should gather a knowledgeable base on Sikh teachings so that the two of us could eventually establish Guru Ram Das University in North America. Building that University remained our dream even until his last days on this earth. At one time with the assistance from his staff, when Professor Balkar Singh was here, we even prepared the application to the State Board of Higher Education. We filled the necessary forms to launch that University in New Mexico with me being the Provisional Vice Chancellor. After the Boston meeting our paths began to cross often. Again, as before, we continued to compare our ambitions and views on the future of Sikhi and Sikhs in USA. Yogi Bhajan was one of the giants of our century in America. His many achievements will be appreciated more and more as time goes on and our history is written. For me, he has been a good friend, a staunch ally, my religious soul-mate, a great visionary and a dear, dear friend. His biological family and family in faith, both, gave me and my wife, Amrita, a lot of love and respect throughout these years that we lived together. Whenever, we meet any of you, the American Sikhs, we think of you as the fruits of Yogi ji’s accomplishments. We thank you to let us share your excitement with the Sikh Panth as you are doing the same this morning. We are here today to convey our personal kinship and appreciation to the total American Sikh community for joining the global Sikh Panth and becoming an important part of its history in the distant lands. You and your entire International Sikh Dharma organization are doing an admirable job in keeping the American youth away from drugs and other social evils, and bringing them back to spiritual living. You are indeed preparing them for the future leadership of the faith in North America. It is a pleasure to see so many familiar faces and those who work so hard for the grand designs of our guru, Guru Gobind Singh. Today is a historic day and the historic days often serve as the rare moments when we can pause from the hustle of our daily lives to reflect on the years that have passed, the accomplishments and people that have made them special. As I look around this gathering, I am filled with countless warmth and fond memories. Many of you go back with us as far as many decades. Others of you are more recent additions to the family. Regardless of when you came, you have been a part of Sikh lives and will continue to be our part. For that, we are so grateful and feel so blessed. At the same time, when stress and anxiety may be high, we urge you to pray and we assure you that we will join in your prayers and aspirations. Now, as most of you know, I'm not one for looking back. But rather what I take from the past is the inspiration for the future. And what you accomplished during the past years in America must never be lost amid the sadness or disbeliefs in the future. You are tools of the Guru’s plans for the Sikh America. When we entered America, we were in a bad dream of Sikh America. Back then, there was hardly any visible Sikhs on this continent. Also there was no literature or available information on Sikhism. It was a time when the ignorance between East and West was pathetic. It was a time of rampant discarding of religion of their forefather by the few Sikh youth who made to this new world. Although our hopes were triumphant the signs on the horizons were scarce that Sikhism would ever survive among the rapidly expanding materialism. It was a time when youth were trampled in the name of evil and corrupt materialistic ideologies, and drug induced paranoia of evil states. All we had left with us was our belief system in charadi kala and our vision that the Guru Panth was here to stay and be here to attract the attention of the modem world. We believed that for the future of our community and the free people, this pathetic state could not continue. And together, we insisted that this great nation must once again rise. In our America, you and most of those in your circles, and many others still shared our belief of the triumphant of spirituality over materialism and in the power of a better tomorrow. Those served our inspirations well. Your efforts succeeded in many places to get the drug culture off the backs of the American people. You created scores of Sikh congregations and businesses to rehabilitate the new Sikh youth. You launched retreats, conferences, symposia and meditation workshops. You brought English and Spanish translations of our scriptures and offered people an alternative to the selfish ideologies foreign to the human soul. You brought many American youth back to healthy, happy and holy life. It is a time when Sikhism can serve a bright beacon of hope and freedom to the youth gone astray. The world is looking to us, not for our military might, but because of our ideas of service, love, altruism, spirituality and higher states of consciousness. After decades of hard work, and with the guidance from the Infinite Wisdom (Vahaguru), morality and spirituality will be winning the war. The world will watch with amazement as we sow the seed of Guru Sabd in the most dynamic nation and most powerful country in the world. And I firmly believe that history will record your contributions as uplifting the youth and bringing peace of mind. Today the new age programs and organizations are in fashion and spreading across the globe. I'm reminded of the old axiom that imitation is the sincerest form of flattery. Only, in this case, it is more than flattery, but grand larceny. It is the intellectual theft of ideas that you and I recognize as our own. But this is a hope, and this is flattery that all of you should be pleased to relish. We are grateful. In the end, it all comes down to leadership. That is what this country is looking for now. It was leadership here at home that gave us strong American influence abroad and the collapse of imperial communism. Today’s youth will be tomorrow’s leaders. Great nations have responsibilities to lead, and we should always be cautious of those who would lower your profile because they might just wind up lowering our flag. Hope lies in new youth and new spiritual youth. You and your leadership are among those. My friends, on a serious note, I would like to end by telling you something Amrita and I have wanted to say to you for a long time. During our years together with you, as you know, things were always on the move. As with all of you, as soon as you accomplish one objective, you will be quickly on to the next. There is so much work to do that there may rarely be time to rest and reflect. Well, one of the bright sides of the occasions like this one is that one gets a chance to reflect back over the years. As you commemorate the passing away of Yogi ji, you will spend many occasions looking back at what you did and what you learned. You will remember the extraordinary events in life that were pivotal to make you worthy of the Guru’s blessings. You would be so busy in accomplishing one step after another, that you would wonder if you would ever get the chance to appreciate them. As Yogi ji used to say, the hand of Guru Ram Das will always be upon you and guide you at every step. You are some of those people who gave so much of yourselves. You are great people. You made sacrifices to support and to help the Sikh Dharma mission achieve many things. Therefore, one may not conclude anything else than saying that you must build a suitable memorial to your contributions when you celebrate Yogi ji’s life. 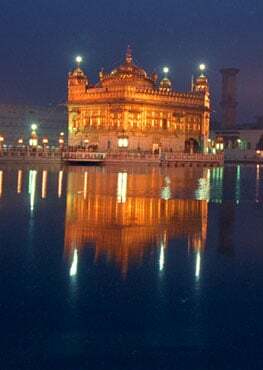 And, the greatest memorial you can build for your friends and for your movement is to gain strength and go out to tell the rest of the world about the treasures of SABD you discovered in the body of Sri Guru Granth Sahib. Then God and Guru will bless you all the way.